Doctors, nurses, as well as other medical staff are too often overwhelmed by the utter number of tasks they need to have accomplished in a day, yet it might feel like they are not doing enough. 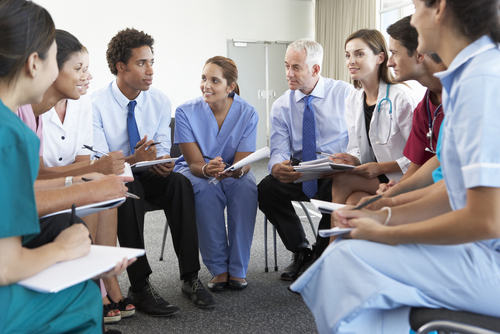 So, what can you do to meet the needs of the patients without overworking your medical staff? It’s all about the productivity of your medical staff. This does not imply that you extend their work hours, rather, it means encouraging them to be more effective at their jobs. The following are some of the ways in which you can ensure increased the productivity of your medical staff. At times, it isn’t that your team is not effective; rather, it could just be that you are using the wrong metrics to measure their productivity. Look into what other organizations in your field are using to measure productivity, as that might give you a better idea of what measurements you should be using. Workflows which feature repetitive or overlapping tasks are one of the most significant contributors to reduced productivity. Moreover, an inefficient workflow could be hindering an employee from performing crucial tasks. For example, having to rely on manual record keeping system could lead to wasted time. Go around this by investing in a proper electronic health records software. Today, there is an abundance of technological resources that can support your workflow to boost productivity in your health facility. A major benefit of using technology is that you are able to eliminate mistakes caused by human error, perform repetitive tasks with ease, and instantly resolve administrative issues. Another major cause for low productivity in any sector is disengaged employees. With up to 70 % of all American workers reporting some level of disengagement from their jobs, it is highly likely that your workers are not fully into their jobs as well. This disengagement is costing industries billions of dollars each year – and the healthcare industry is not an exception. According to the WHO, the best way to motivate your staff is through rewards or incentives. These rewards do not need to be monetary. Social recognition and other small gestures such as giving positive feedback can go a long way in boosting an employee’s prestige and motivation. Nonetheless, cash-based incentives every now and then will be highly welcomed. Work-related stress is one of the major causes of occupational ill health, human error, and poor productivity. The gravity of this situation is not one to be taken lightly as close to 25 percent of U.S workers revealed that they had been diagnosed with depression at some point in their lives. However, a majority of those undergoing these mental health problems do not know what they are going through or do not reveal it to anyone. Nonetheless, the effect is still the same; billions of dollars in lost revenue. In fact, the effects of depression alone are costing U.S employers an estimated $100 billion every year. These losses stem from increased cases of sickness absence, a high turnover rate, and poor performance. To mitigate this issue, begin by evaluating your performance metrics so that you can ensure you are not placing unnecessary stress on your workers, and then consider bringing in a mental health counselor. As mentioned earlier, most people do not know that they are suffering from mental health issues. By bringing in a counselor, you might just be able to resolve a lot of the issues surrounding poor productivity among your staff. Medical staff is usually under a lot of stress to cater to everyone’s needs and to ensure that they keep a smile on while at it. However, they’re still human, and all that pressure is eventually going to get to them. To ensure that your staff performs at their best, ensure that you remove all barriers to effective performance by incorporating efficient workflows. However, that is not all; you also need to ensure that your staff members are at the right mental state when doing their jobs.